The Code Matrix Browser (CMB) offers you a new way of visualizing which codes have been assigned to which documents. The matrix provides an overview of how many document segments from each document have been assigned a specific code, and this for each existing code. The Code Matrix Browser is constructed as follows: Documents are listed in the columns while codes are listed in the rows. The symbols at the conjunction points represent the number of coded segments that are coded with a particular code. The larger the symbol, the more coded segments are assigned to the code in question. After opening the Code Matrix Browser an options window will appear, which allows you to change display options. Often, only the activated documents might be of interest, for example. Documents – No grouping, every document has a column. Document groups – The columns are made up of document groups. The coded segments of the documents in each group will be summed up. Document sets – The columns are made up of document sets. The coded segments of the documents in each document set will be summed up. Focus Group Participants – Focus group participants are displayed in the columns. Only for activated focus group participants – Only activated focus group participants will be displayed in the columns. This option is visible only when the focus group participants were selected for the columns. Only for activated codes – Only the activated codes will be displayed as rows. Use weight filter – Only coded segments with a weight within the limits of the currently defined weight filter will be used. Count hits per document only once – This option will be displayed only if a code occurs infrequently within a document. The unit of analysis is therefore not the individual segment, but rather the full document. Interactive Quote Matrix – Displays the coded segments from the table in an interactive window. Create hierarchical codes – If the option is activated, the codes are displayed in the tree structure of the code system. Even if the “Only activated codes” option is selected, non-activated upper codes are also included to preserve the tree structure. If the option is deactivated, all codes are displayed on one level. If the “Only activated codes” option is activated, then only the activated codes can be displayed. Names, columns: none/short/full – Determines display of document names in column headers. Calculation of symbol size refers to all coded segments. Calculation of symbol size refers to the column. Calculation of symbol size refers to the row. Count hits per document only once – The Code Matrix Browser display will be based not on the number of coded segments but rather on the full document, meaning it will display only whether the code occurs in the document or not. For collapsed subcodes, the code frequency of the subcodes will be aggregated. Binarize view – Regardless of how many coded segments are present in a cell, this function displays only whether a coded segment is present or not; the symbol size is therefore unified. Even when a collapsed subcode with multiple encodings is present, only one will be counted. Sum – displays the sum of rows and columns. Refresh – updates display via the Refresh function. Copy current clipboard view – Copies the visible area to the clipboard so that you can easily copy the code matrix browser’s results into reports or publications by using Ctrl + V (Windows) or cmd + V (Mac). Open as Excel table – Displays the matrix with the code frequencies of the Code Matrix Browser in Excel. The columns and rows are reversed to allow an easier import into SPSS. Export – Exports the displayed matrix as values, meaning the number of coded segments per code and per document, in Excel or HTML format. The columns and rows are reversed to allow an easier import into SPSS and other statistics programs. Exporting as a graphics file (Vector or Bitmap) is also possible. What is actually shown in the Code Matrix Browser? The size and color of the clusters in the matrix show you how many document segments in each document have been assigned each particular code and subcode. The larger the cluster, the greater the number of segments that were assigned this code or category in this document. The name of the document, the code or subcode, and the number of coded segments assigned to the code are shown in the box. 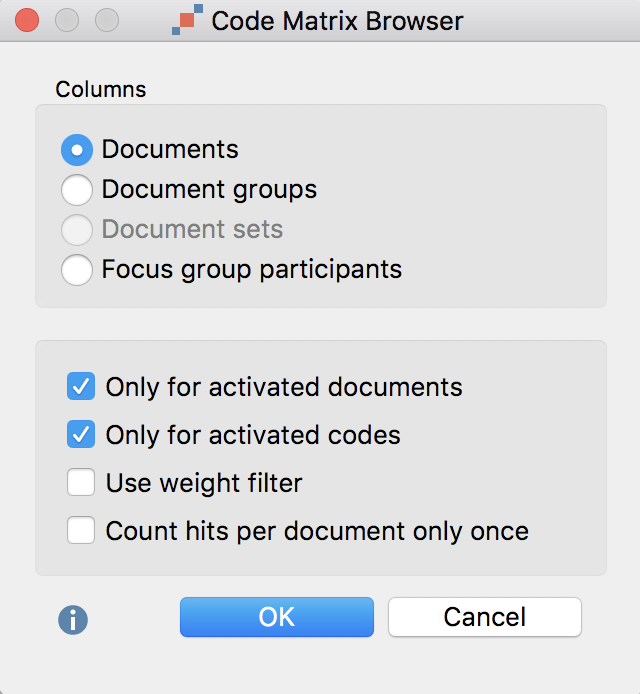 The number of documents that can be displayed as columns in the matrix depends on this setting. In most cases, it is sufficient to use short document names, showing only the first few letters, which nevertheless is enough for you to recognize it. If in doubt about a document, you can take a look at the screen tip, where the full document name is displayed. If necessary, the width of the columns can be adjusted by clicking on a dragging the lines between column headers. For focus group participants, the names of the participants will be displayed in the columns in the place of the document names. Tip: The order in which the columns are displayed is determined by the order of documents in the Document System. If you wish to change the order of the documents, you must change the order of the documents in the Document System. The columns can be easily moved with the mouse. In this way, you can easily compare the coded segments of two different documents or focus group participants. By default, the codes are displayed in the CMB in the same way as in the “Code System,” that is, in a hierarchical “tree” structure. Subcodes can be collapsed in the usual way, by clicking the – symbol. When the subcodes are collapsed, the number of coded segments is aggregated on the parent code level. If a parent code (that hasn’t been used in the document) has three subcodes with 10 coded segments each, when you collapse the subcodes, the parent code will show 30 coded segments. The document segments that have been assigned a particular code can be called up immediately by double-clicking on the symbol. The relevant document and code are then activated and the coded segments appear in the “Retrieved Segments” window. It is possible to keep the CMB open, allowing one to easily view the contents of different symbols. How is the symbol size determined? MAXQDA determines the smallest and largest code frequency of all displayed nodes and then divides the distance between these two values into seven equally-sized value ranges. The smallest value range receives the smallest symbol and the largest the largest symbol. In addition, the maximum distance between the displayed code frequencies is taken into account. For example, if codes occur only once or twice in the displayed documents, this distance is very small, and neither the smallest nor the largest squares will be used, but two medium-sized ones, so as not to over-emphasize the difference. The following graphic shows which square sizes are used at which distance between the smallest and largest values (the range). If the smallest displayed value is e.g. 5, and the highest is 8, then the range is 8-5 = 3. The cells with value 5 are then assigned the smallest square from row “3”, the cells with value 8, the largest from this row. 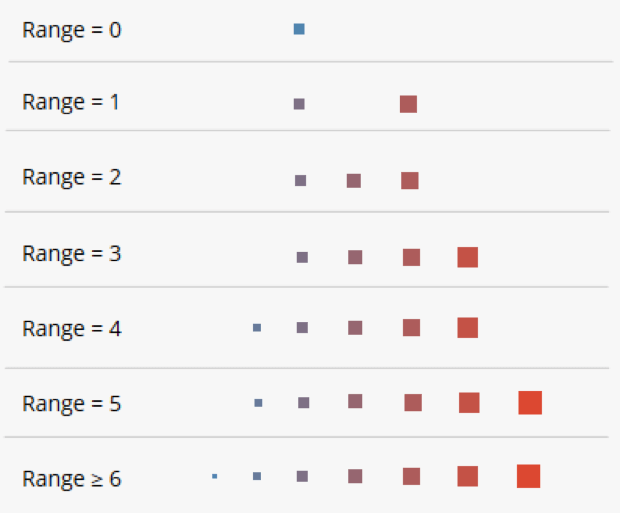 If all the visualized numbers are identical, a medium-sized square will be displayed for all values. The zooming-out of codes can change the overall view because this may change the smallest and/or the greatest value. If the Calculation of symbol size refers to the column/row option is selected, this mechanism is applied individually to the column or row. The Export icon in the toolbar allows you to export the Code Matrix Browser as currently displayed. This file can later be inserted into a word processing program or Powerpoint slide. Click on the camera icon to copy the actual view into the clipboard. Now you can open Word, PowerPoint, or other programs and paste the image into it by choosing Ctrl+V (Windows) or cmd+V (Mac).